Whether you are a hunting enthusiast or just a wildlife watcher, fall is a great time to watch white-tail deer. As we spend time among the native plants, we observe that some plants seem to be favorites with the deer during the fall. Here are the top 5 favorites as we see it. Tickseed Coreopsis (Coreopsis lanceolata) – this plant seems to be a deer magnet. While it is eaten year-round, we find that the leaves are especially relished in the fall and winter. During the winter, deer also paw the plants out of the ground and eat the roots. Purple Poppy Mallow (Callirhoe involucrata) – while this species is a favorite with many people because of the beautiful fuchsia blooms, it is also a favorite plant of deer. The leaves green up in the fall and remain green throughout the winter, and during this period, the deer find them irresistible. They also eat the carrot-shaped root of this plant, especially during the winter. River Oats (Chasmanthium latifolium) – this cool season grass, unlike most other cool seasons, produces seed in the fall. Deer savor these seeds. They strip them by the mouthful from the plants. Virginia Wild Rye (Elymus virginicus) – another cool season grass species, Virginia Wild Rye makes seed earlier in the summer when most cool season grasses do. During the fall, it grows new leaves, and deer delight in seeking this new growth out to eat. 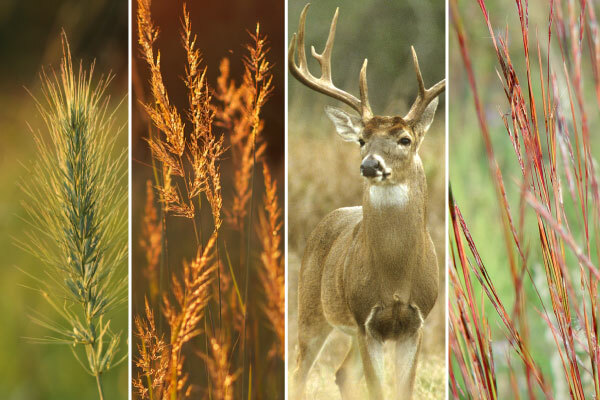 Little Bluestem (Schizachyrium scoparium), Indiangrass (Sorghastrum nutans), and Switchgrass (Panicum virgatum) and other tall grasses – while these grasses are not favorite food sources, they are an important part of habitat. Deer feel safe because they are concealed and will bed down in the grasses. In our observation, a stand of grasses that are adequately tall to conceal the deer while lying down but short enough that they can see for a distance over it is ideal. A special thanks to our dedicated deer enthusiasts, Mike Motzkus and Colt Hamilton, for sharing their observations about fall favorites for deer.